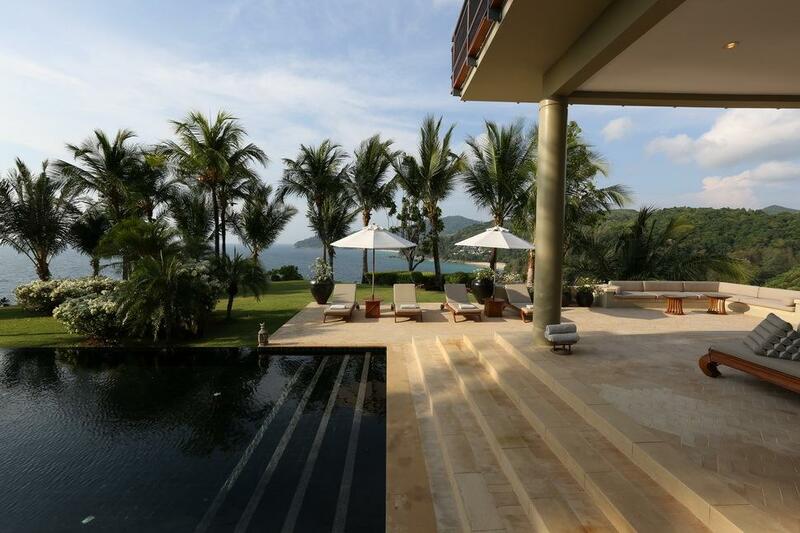 Villa 4469 takes pride of place within one of Phuket’s most exclusive luxury residential estates and occupies a stunning headland just south of Naithon beach on the island’s unspoilt, scenic northwest coast. 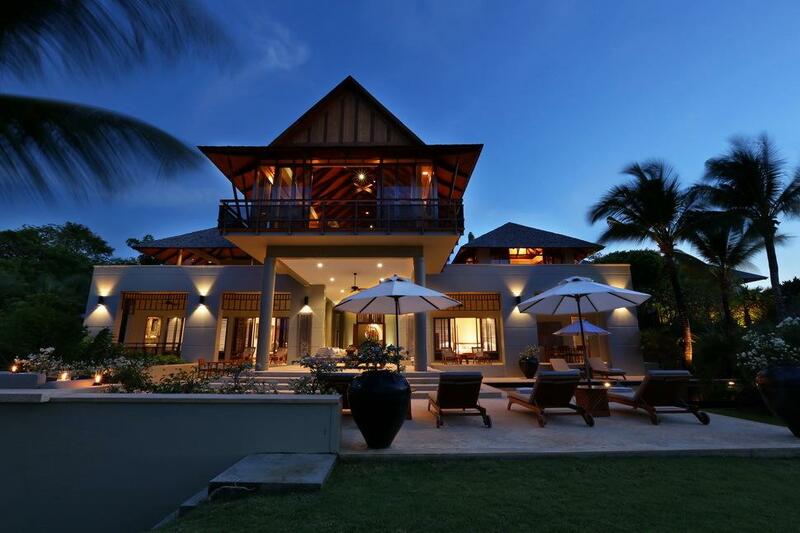 The spacious living areas and outdoor spaces that make up this majestic, 5+1 bedroom holiday home are spread over two storeys and the entire house is surrounded by gentle manicured lawned gardens, mature tropical palms, and bathed in breathtaking 270˚ocean views. 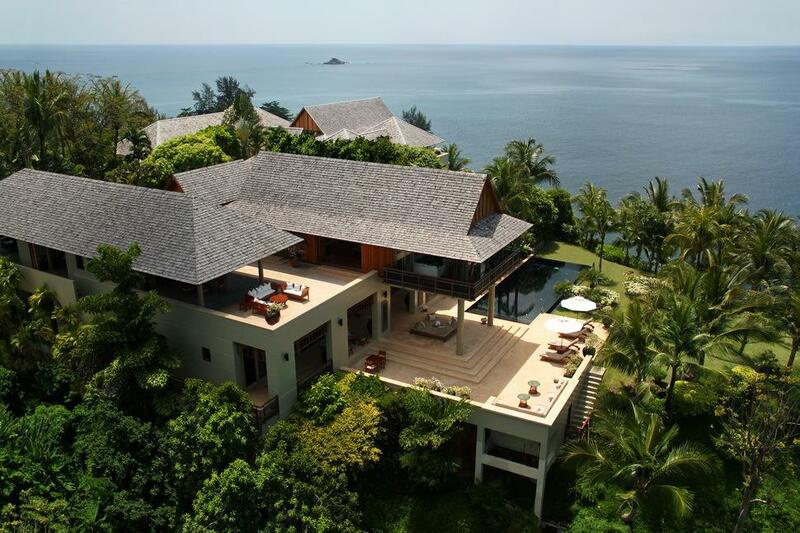 Traditional Thai-style pointed roofs, vaulted ceilings and a choice of wide outdoor terraces provide guests with an impressive amount of private space to enjoy, even when the villa is fully occupied. The equally generous 15 metre pool is the perfect base for daytime relaxation, or beach lovers can take a short drive to nearby Banana beach, which is nestled into one of the island’s few remaining undeveloped bays. 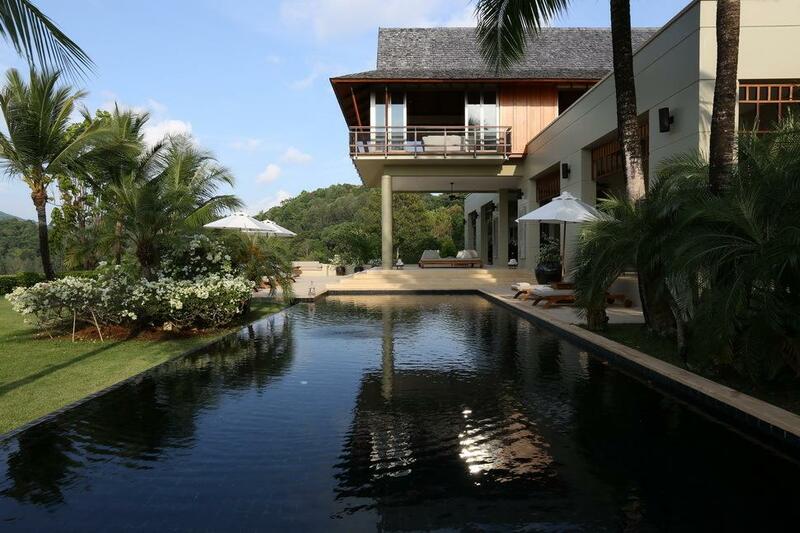 Subtly placed Asian collectables and artwork throughout the villa create a rich sense of the East, while teak furnishings, wood-floored interiors and hand-made sandstone outdoor tiles add a practical element to the pleasing architecture and warm, welcoming design scheme. 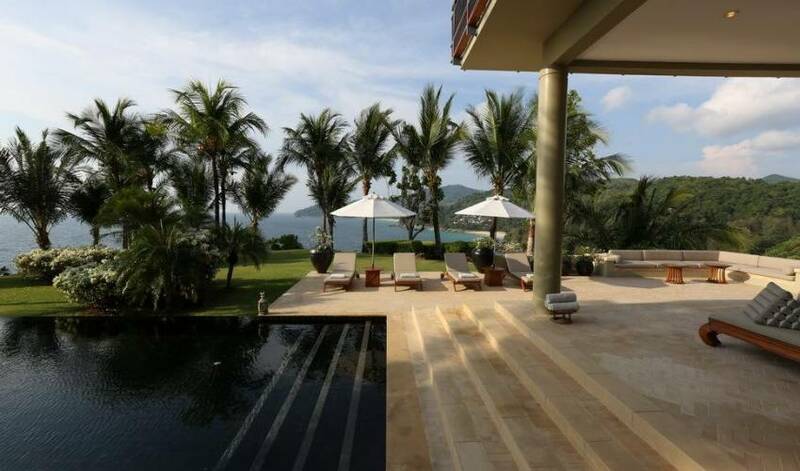 Villa 4469 is the perfect choice for a large family or group of friends who appreciate tranquil private luxury surrounded by tropical splendour. 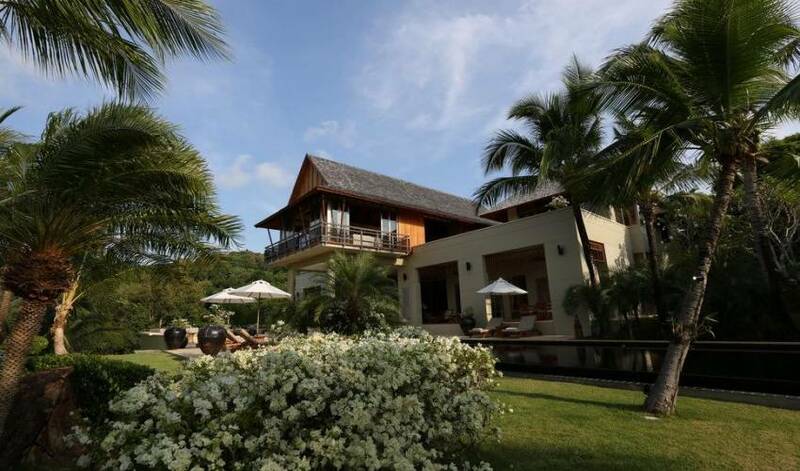 The villa’s full time staff includes a skilled Thai chef to prepare delicious meals and the property is one of only 7 private residences within a quiet gated and guarded community. 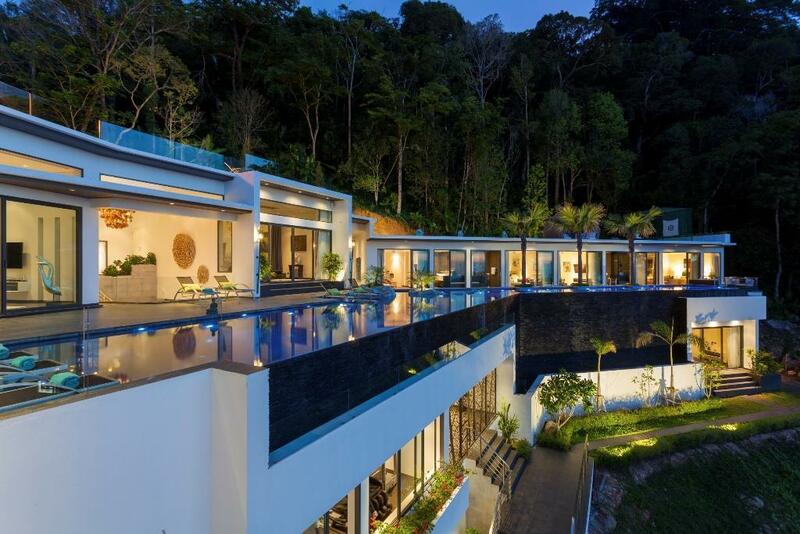 As you pass the guardhouse and enter this exclusive estate, a small drive to the right leads up a gentle slope to Villa Nobhadol’s main entrance, which also features a covered carport. 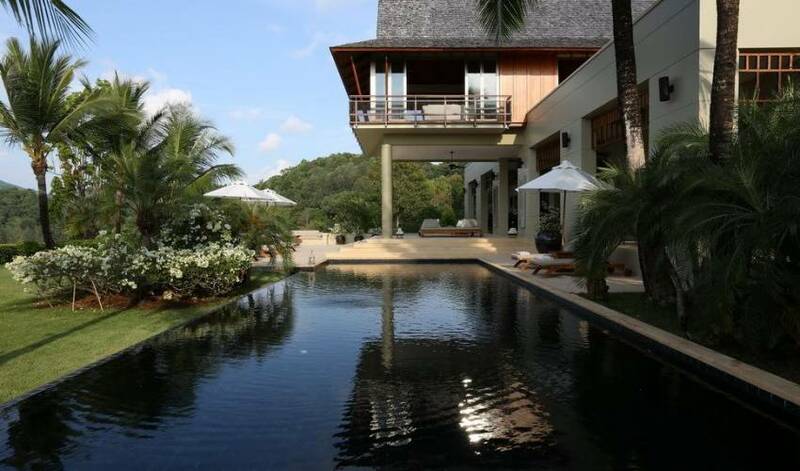 From there, steps lead down the side of the house for staff to come and go discreetly, while the main guest entrance is marked by a carp-filled pond shaded beneath a mature Mango tree, with a guest cloakroom and storage space either side of the front door. Once inside, an airy inner atrium affords immediate and dramatic views through the beautifully furnished upper floor living area and out to the stunning seascapes beyond. Before you reach the main lounge area, a wide spiral staircase descends to the villa's lower level while sliding glass doors to the right open directly onto an expansive dining terrace, furnished with a 10-seater circular wooden dining table fitted with a Lazy Susan. The lounge is furnished with three large cushioned sofas and a low teakwood coffee table. The room is surrounded on three sides by sliding glass doors that allow for constant breezes and permanent sea views. Out on the dining terrace, al fresco meals can either be enjoyed under the stars or in the shade of a large shingle roofed “sala”, behind which sits the villa’s fully equipped kitchen where the staff prepare a delectable range of snacks and meals throughout the day. Also on the upper floor, an expansive master suite is reached via a wide terrace furnished with planter’s chairs that also offers striking coastal vistas. The interior is furnished in teak with a four-poster king size bed, a TV and a writing desk looking out over the ocean. There’s also a walk around to a private dressing room and the room then extends all the way to the back of the property where there’s a generous ensuite bathroom with tub and the choice of an indoor or private outdoor shower. 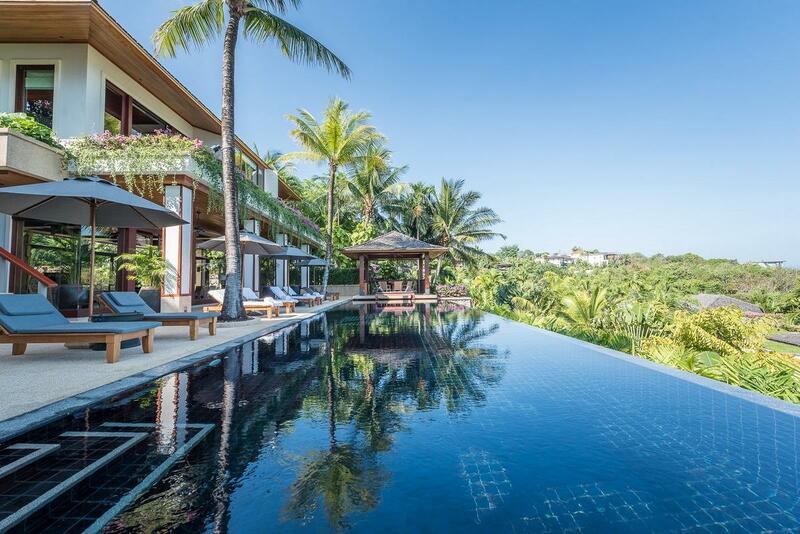 On the villa’s lower floor, guests are greeted by a wide central, shaded terrace furnished with two sofas and a Thai style cushioned daybed, ideal for lazy afternoons. From there, steps lead down to the lawned garden and 15-metre pool with loungers and sunbrellas positioned for daytime relaxation. The wide lawn slopes away at the edge of the headland, but is surrounded by a safety fence for added peace of mind. 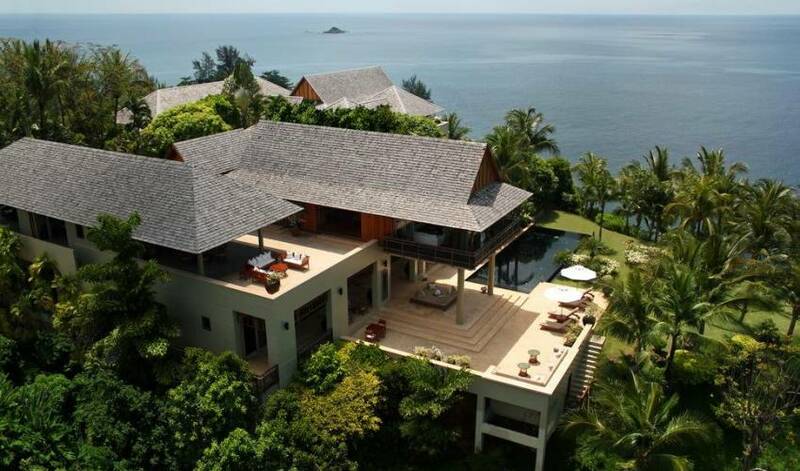 Four bedrooms are also located on the lower floor of the villa. The second master suite is below its upper level equivalent and opens onto a terrace just a few steps from the garden and pool. This spacious bedroom also features a four-poster bed and writing desk, as well as a comfortable sofa and armchair and boasts a substantial ensuite bathroom with tub and shower. A third suite is positioned to the right of the relaxation terrace and features a double bed with a built-in writing desk and a spacious bathroom with private tub. Restored wooden doors from this bedroom open directly onto an attached twin bedroom, making it the ideal choice for a family. Two further double guest bedrooms are located at the back of the property separated by an inner courtyard with a fountain water feature. These bedrooms also connect to a dedicated TV lounge and library, furnished with plush sofas and a flat screen TV. This rear wing also houses a private office for guests that need a quiet space to work or study. An artist, poet or novelist would immediately feel at home in the tranquil, picturesque surroundings of the villa. 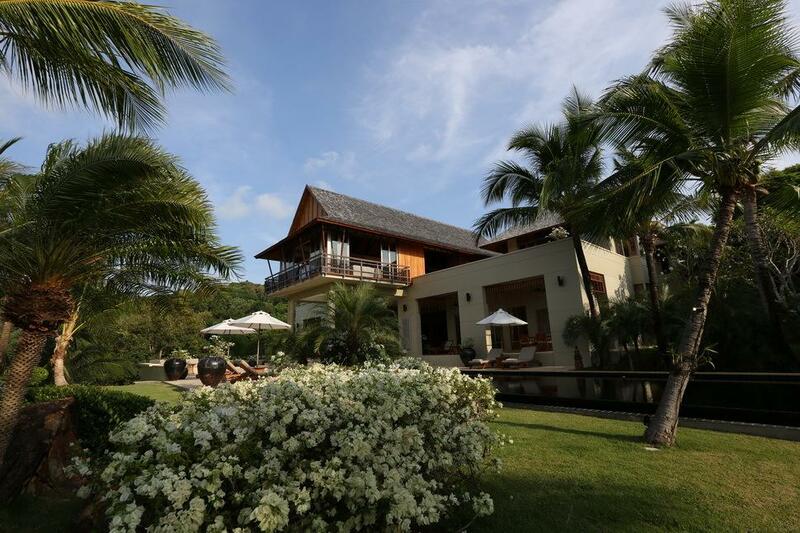 The gentle green and blue hues of the views that frame the villa are perfectly complemented by its warm teak wood interiors, and a relaxed, private atmosphere cushions you from the outside world as soon as you walk through the door. 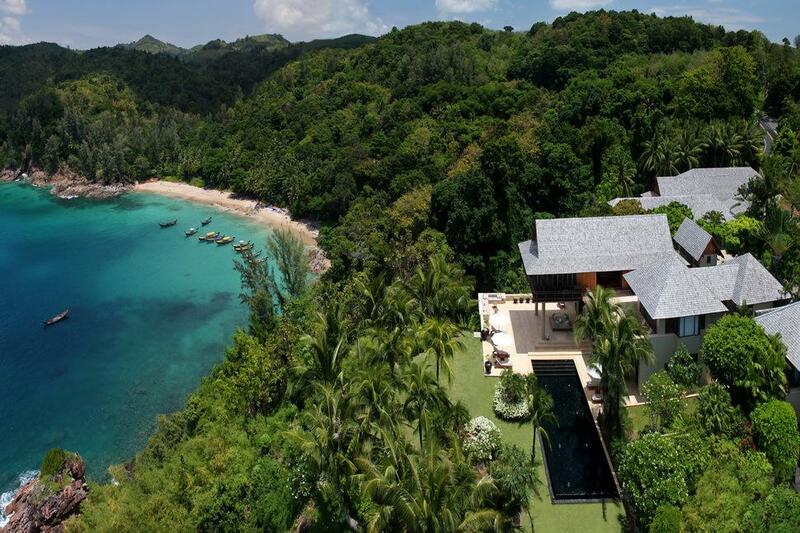 The villa occupies one of the most breathtaking elevated locations on the island and the architect has certainly made the most of the wide ocean and tropical hillside vistas. 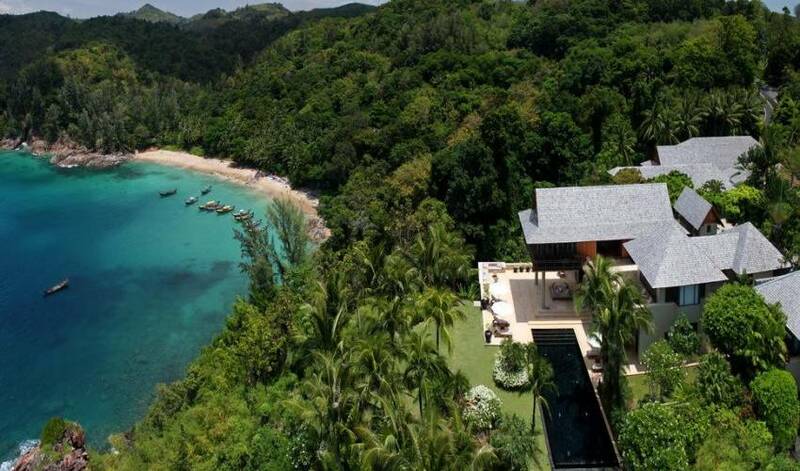 Close proximity to an almost hidden treasure that is Banana beach (only accessible on foot or by boat) is a rare addition for a cliffside property and guarantees lovers of the sand and the sea will not be disappointed. 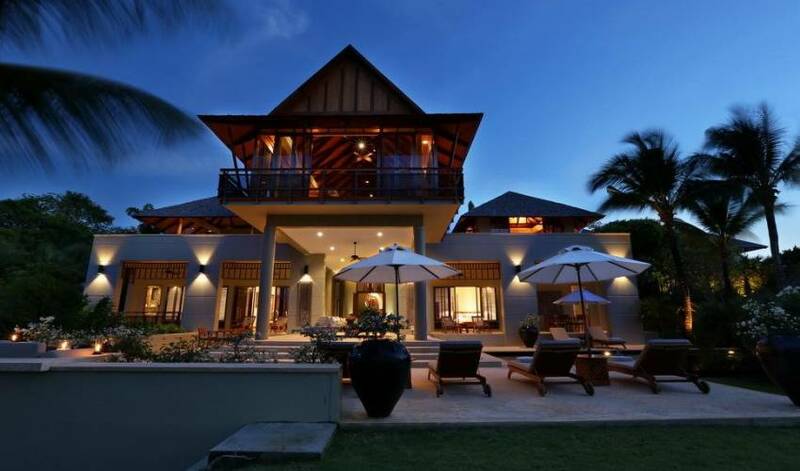 Clever synergy throughout the villa’s design makes it easy to settle into a relaxed routine of homely holiday pleasures. Poolside is the most appealing place to be during the day, either stretched out on a comfortable sun lounger, reclining with a book on the shaded lower terrace or drifting through the generous garden. Evenings call for a move upstairs to the upper floor dining terrace for sundowners and evening meals, but the size and layout of the villa also means it’s easy for large families or groups to find a happy balance between communal and private moments. The bedroom suites offer self contained comfort – even for children in the family room – and additional facilities such as the TV lounge and office mean that everyone is catered for either indoors or out, no matter how they wish to pass the day. The soft spoken villa staff efficiently but unobtrusively go about making sure guests have everything they need for a perfect stay. The chef prepares fabulous local and international food in the well equipped kitchen, which prompted one guest to describe Villa 4469 as “the best restaurant on the island”. Other than occasional trips to the beach, there’s very little reason to venture far from the peaceful surroundings of the villa, but guests with the urge to eat out have plenty of options within easy driving distance. One of the island’s top luxury resorts, Trisara, is right next door to the estate, and there’s a multitude of choices for dining and entertainment offered within the nearby Laguna resort complex. 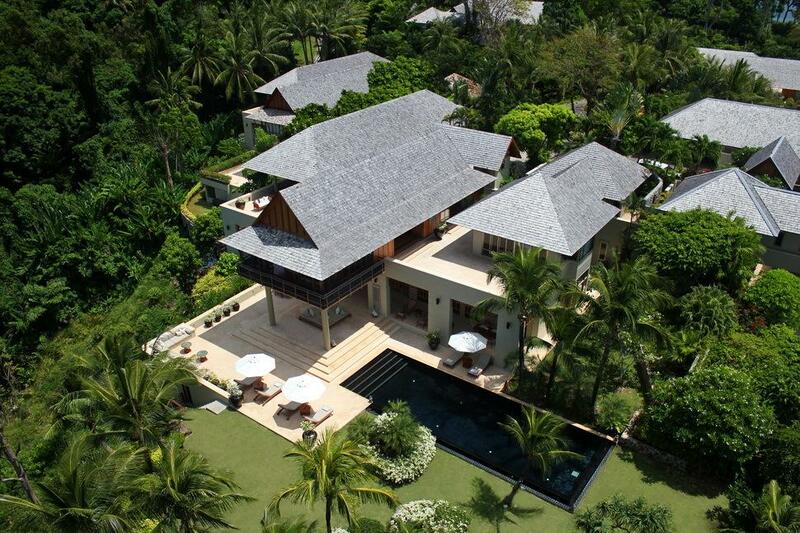 The Villa is nestled within the pristine tropical surroundings of a private estate in one of the most exclusive parts of Phuket’s stunning west coast. 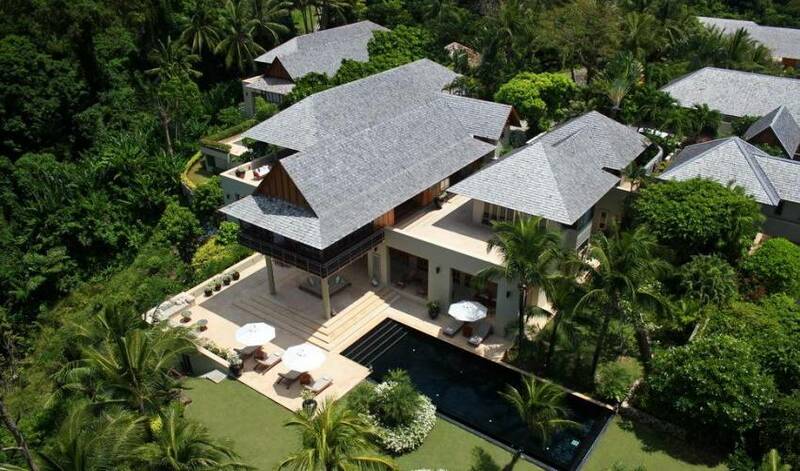 The villa enjoys a secluded cliffside location close to some of the island less visited beaches, yet is also just 30 minutes’ drive from Phuket International Airport. Laguna Phuket is 15 minutes away by car and the recently opened Boat Avenue shopping complex features an upscale “Villa” supermarket with a wide choice of imported food and wine.